If you read my last two posts (here and here), you know I spent two exhausting days in Washington scrupulously touring the museums. I think it’s possible, with enough stamina and planning, to see most of the Washington museums in one day, at least if you’ve been there before and don’t need to spend a lot of time with the permanent collections. You should at least be able to check out all the important special exhibitions in one day. There's no reason to see everything -- no sane person needs to be as obsessive about this as I am. Transportation should cost about $100 round trip if you’re careful which Amtrak train you take, or about $40 if you take the Chinatown bus. Amtrak doesn’t have wifi yet, like some of the buses, but they usually have electric outlets, half decent bathrooms and a snack bar; and it's pretty comfortable and reliable. Here's the Amtrak website for buying tickets. The cheapest Amtrak ticket I found is $49 each way. One of the $49 trains departs New York Penn Station at 7:17 a.m. (Newark Penn Station at 7:33 - same price), and arrives in Washington Union Station at 10:40 a.m. (3 hr, 23 min). There’s another $49 ticket for you slackers that departs at a more civilized 8:10 a.m. (Newark at 8:26 a.m. - same price) and arrives 11:29 (3 hr, 19 min), but you’ll miss an hour and a half of museum going. A Metro fair card with about $4 or $5 on it should cover your subway transportation. Don’t buy food in the museums or on the Mall unless you’re really strapped for time — it’s relatively expensive ($5 for a hot dog at a stand!) and not very good. Union Station has a large food court in the basement; a quick lunch or dinner there when you arrive or depart would probably be better. Or bring a lunch and eat it on the train — it’ll save time. The best day of the week to go is Thursday because The Phillips Collection stays open until 8:30 p.m. on Thursdays; the other museums close between 5 p.m. and 7 p.m.
Go here first because it closes the earliest, 5 p.m., and it's the nearest to Union Station -- and it's the best. 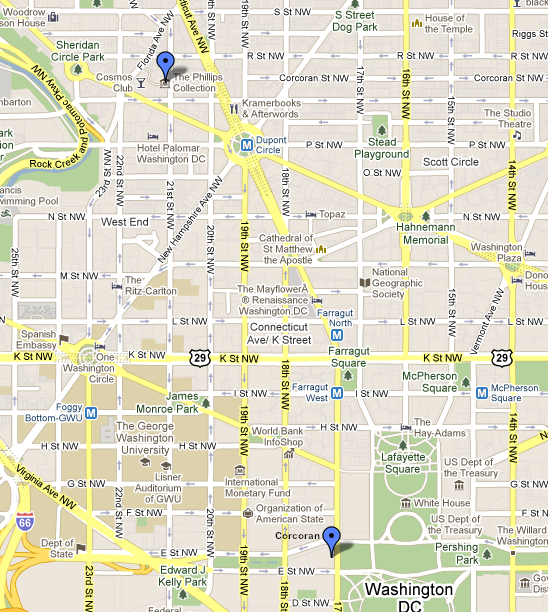 It’s an easy 15 minute walk from Union Station via Louisiana Ave. to the National Gallery East Wing. It’s about 0.8 mile and goes through a park and, toward the end, along a highway; or take a taxi from in front of Union Station (about $7 including tip). 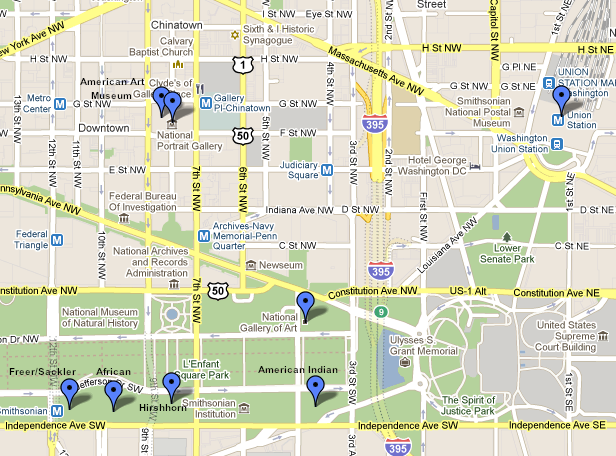 The American Indian Museum is directly across the Mall from the National Gallery. Keep The Portrait Gallery and American Art Museum for later in the day since they close at 7 p.m.
500 Seventeenth Street NW. The main entrance is located on Seventeenth Street between New York Avenue and E Street NW. The Corcoran is just a few blocks away from two Metro rail stations: the Orange/Blue lines (located right in front of the Freer) to Farragut West (four stops), exit 17th street; or take the Red line (located near the Portrait Gallery and American Art Museum) to Farragut North (two stops), take the K Street exit. From either station, walk south on Seventeenth Street to the Corcoran. 1600 21st Street NW, near the corner of 21st and Q Street. 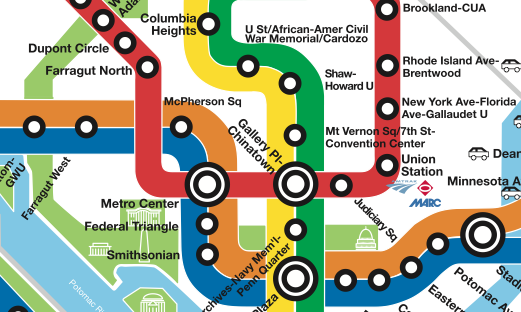 Take the Red Line to the Dupont Circle station. Make sure to use the Q Street exit from the station to avoid several minutes of extra walking. At the top of the escalator, go left (west) on Q Street to 21st Street. You can make the best use of your time by keeping the Phillips for last when the other museums have closed. After you’re done here you can go back to Dupont Circle and take the Red Line Metro to Union Station to get the train back home. The only $49 return train I know of fortunately leaves at a good time, 8:45 p.m. Union Station is a terminal, the trains start and end here, so you don’t have to worry about getting a seat. If all goes well, you should arrive at New York Penn Station at 12:10 a.m. (Newark Penn Station, 11:52 p.m.). One of my favorites, not on your list, is the Renwick. Anyone who goes to the Corcoran should take in the Renwick as well. The Renwick, of course — for the building alone. You pass it walking down 17th Street from the Metro station to get to the Corcoran. While you’re in the area, you may also want to check out the Octagon Building a block east of the Corcoran. It claims to be the oldest museum in the U. S. , and it’s the home of the American Architectural Foundation.